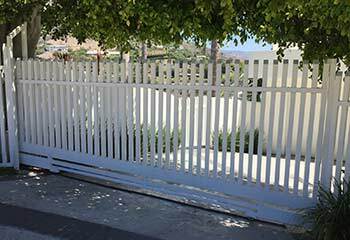 Here you can follow our recent gate repair and installation projects and learn what sort of work our team has been doing. Scroll down to see the list of our latest completed tasks. 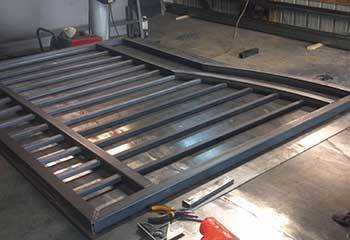 Customer Issue: One of the leaves of the customer’s swing gate was damaged by a backing vehicle. Our Solution: A replacement aluminum bar door leaf was installed to replace the damaged section, along with some cosmetic customization and a new set of hinges. The opener’s actuator arm was also damaged, and needed some welding and reattachment work before it could resume operation. 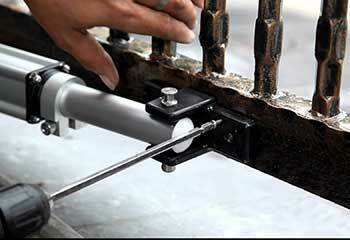 Customer Issue: The customer’s sliding gate was making grinding noises, and moving with increasing slowness day by day. Our Solution: Visible scratch marks on the tracks clued our team in to a broken roller being the culprit. They polished and treated the tracks, and then took the gate off and installed a new set of rollers before putting it back in place. Customer Issue: The customer’s gate simply refused to move from the open position. Our Solution: Our team thought it might be an opener issue at first, but it turned out to be a jam in one of the actuator robot arms. After unplugging the opener, they took apart the arm and bent the warped segment back into shape before reassembling and testing it.